Parineeti Chopra, Sophie Turner & Isha Ambani Enjoy Priyanka Chopra's Bachelorette Bash! Home » Bollywood News » Parineeti Chopra, Sophie Turner & Isha Ambani Enjoy Priyanka Chopra’s Bachelorette Bash! Parineeti Chopra, Sophie Turner & Isha Ambani Enjoy Priyanka Chopra’s Bachelorette Bash! Priyanka shared a string of photographs from her bachelorette party. 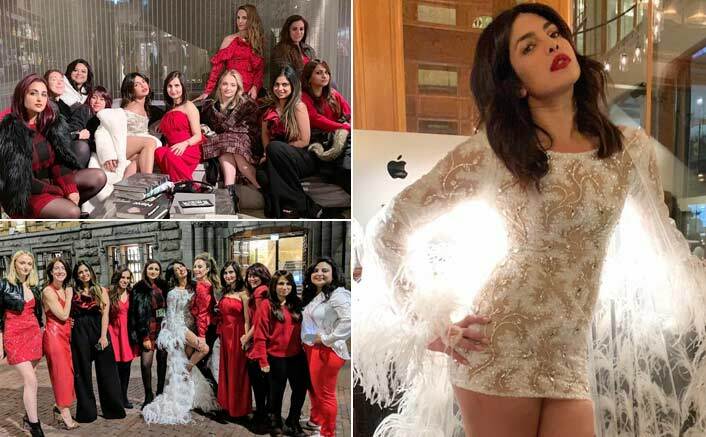 Bollywood actress and bride-to-be Priyanka Chopra, who is engaged to pop singer Nick Jonas, celebrated her bachelorette party with actress-cousin Parineeti Chopra, heiress Isha Ambani and Game of Thrones star Sophie Turner among many others. Priyanka shared a string of photographs from her bachelorette party. The first post has images only of the Mary Kom star, dressed in a short white dress with a feathery cape. “Featherweight Champion of the world,” she captioned it. The second post is all about her bridesmaids, who are dressed in red. “Red, white and Bride!” Priyanka captioned the photograph, which featured Parineeti, Turner, Natasha Pal, and billionaire heiress Isha Ambani among many others. In the third photograph, Turner and Priyanka are seen sitting on a couch wearing sleep masks that reads — “Hungover”. Rihanna SLAMS US President Donald Trump For Using Her Music At Rallies! “The morning after,” the image was captioned. Parineeti took to her own Instagram page to share a group photograph. She retained the caption “Red, white and bride” but added the hashtag, ‘PC’s bachelorette’. Priyanka and Nick are reportedly getting married at Rajasthan’s Mehrangarh Fort in December. The two got engaged in August in a traditional Roka ceremony at her residence in Mumbai.